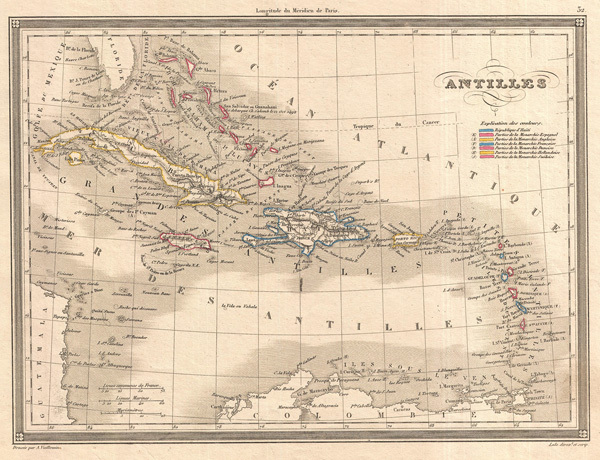 An attractive 1852 map of the Caribbean by A. Vuillemin. Details color coded colonial holdings, relief shown by hachures. Features a beautiful frame style border. Prepared by A. Vuillemin for publication as plate no. 32 in Maison Basset's 1852 edition of the Atlas Illustre. Vuillemin, A, Atlas Illustre, (Maison Basset: Paris) 1852.